Diving in Roatan and the Bay Islands is thrilling for divers of all experience levels. Most dive operators are located either on Roatán or Útila with a couple on Guanaja. The best times to dive are February to early October with balmy weather and water temperature of 81-88°F (27-31°C).Visibility averages at 66ft (20m) unless there is a runoff from the mangrove swamps. Diving in Roatan is never dull with dramatic drop-offs, sloping reefs, and boulder formations. A signature dive site is called Mary’s Place which features a sheer vertical fissure cut deep into the barrier reef. Other good dives include wreck dives like Odyssey Wreck and Prince Albert Wreck. Útila is famous for its whale shark sightings that often happen at the west end of the island. The best time for reliable whale shark sightings is during March to May and August to October. Access Cayos Chocinos from either Roatán or Útila to see its pristine coral reefs. 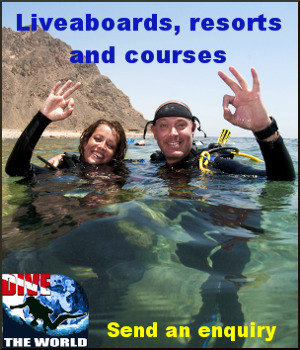 There are 16 buoyed dive sites here which are teeming with marine life but do be wary of strong currents. Guanaja is the least developed of the three islands and the least visited so diving here is a very personal experience. Dive sites here feature a series of pinnacles, vertical walls, lava tunnels and shipwrecks. Guanaja is located right at the edge of the Mesoamerican Barrier Reef System and this attracts pelagic marine life to the area.